The coat was made by covering a lady silhouette from piece of card stock with dark red velvet fabric, accessorized with a silver belt (a button) and crystal "buttons", white fur (made from ribbon) and a chic matching handbag with a golden bead handle. The background is currently my favourite paper and it comes from Casa Retro: it is light blue vellum paper, with delicate snowflakes. This is why I am entering the card into the Gingersnap Creations challenge (GC135 - Use Your Favourite Paper). They have a wonderful prize but even more attractive is the chance of being a Home Page Artist. I am also entering the card into the Creative Card Crew challenge (#2 Seeing Red) and into the My Time to Craft challenge (171 Your Favourite Embellishment - mine are crystals, they add elegance and class to any card!). What a fabulous and fun card! 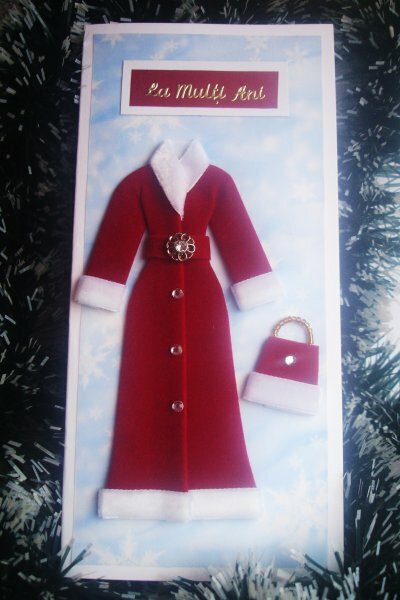 I love how you've constructed the glamorous winter coat and handbag, and I can see why you love that snowflake paper so. Thanks for sharing with Gingersnap Creations! Wow!!! I thought this was factory made. I am so impressed. Awesome creation. Thanks for seeing red with us at Creative Card Crew. Thank you very much for your lovely comments, I also turned off word verification! Thanks for telling me! have a wonderful week! This looks lovely. What an elegant outfit. Thanks for joining us at Creative Card Crew.